(1) IP chapter: Leaked draft texts of the agreement show that the IP chapter would have extensive negative ramifications for users’ freedom of speech, right to privacy and due process, and hinder peoples’ abilities to innovate. (2) Lack of transparency: The entire process has shut out multi-stakeholder participation and is shrouded in secrecy. Tony Abbott and his Govt. 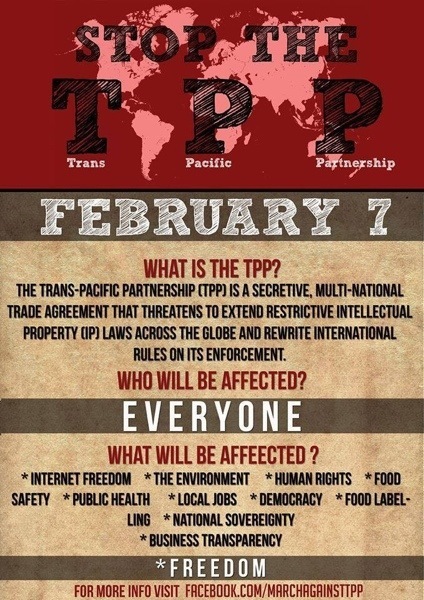 are fully supporting the TPP…as did the previous labour team..both sides of Govt. have sold out to Agenda 21..the G20 will be the final nail in the coffin…Australia has lost its sovereignty. The police state is now being finalised..kiss your freedom goodbye. Makes one ask the question who is paying who behind the scenes and which burerats are advising our so called government ,,what a joke one can no longer have any faith or trust in any politician ,, we were told years ago the lucky country where now is the Luck ,, gone down the sewer of filth & lies , POliticians why are you hell bent on selling out our freedom ?? do you support communism ?? ?